DT Services Ltd based in Hull offer a professional range of entrance solutions for your business. They have an experienced team of installers that can supply and install your commercial doors in Hull & Yorkshire. With over 20 years of experience of providing entrance systems in Hull and the surrounding area, DT Services Hull Ltd install industrial doors in Yorkshire, Lincolnshire and throughout the Midlands. 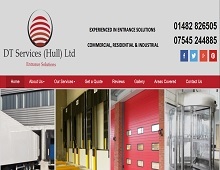 If you are looking to improve the security of your business premises or managed block of flats then DT Services Hull Ltd can help secure your property with newly fitted security doors in Hull, Yorkshire and across the Midlands. Contact them today for a free quotation or to arrange a call out.